The People's Budget Campaign is a grassroots campaign for state budget and revenue policies that meet human needs and fulfill human rights, organized in close collaboration with National Economic and Social Rights Initiative (NESRI). Early on in the post-2008 economic recession, the Vermont Workers’ Center decided to embed the fight against state budget cuts in a broader rights-based vision of a People's Budget. This vision helped to develop unity among various campaigns and constituencies, centered on the demand for a pro-active, systemic solution to the budget and revenue crisis. It also avoided competition between different groups defending their slice of a wholly inadequate pie. 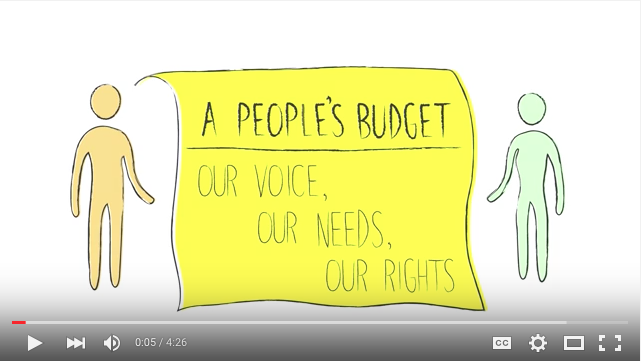 The People’s Budget fosters a coherent approach to economic and social rights, expanding the ongoing campaign for rights-based healthcare financing to other rights that also require a more equitable distribution of resources. Within a year of its formal launch in March 2011, the People’s Budget Campaign succeeded in taking the annual budget debate to a new terrain and achieved its first legislative success. The Vermont legislature included in its annual budget bill new requirements for the budget process, as demanded by the Campaign. For the first time in history, Vermont statutes now defined the purpose of the state's budget. This definition closely matches human rights obligations: the state budget must address people's needs in a way that advances dignity and equity. The new law also requires the Administration to set up a meaningful process for public participation in budget and revenue decision-making, and to monitor whether the budget meets its purpose through a system of outcome measurement. These new legal provisions constituted a step toward developing a People's Budget, and were taken from a comprehensive model bill created by the campaign, which continues to serve as the basis for legislative advocacy such as the Human Rights Council response to the 2015 budget proposal. Watch the People's Budget short animated film here (and FAQs here). The People’s Budget Campaign is developing tools for human rights budgeting at the state level, yet the tools can also inform city level and federal debates. Beyond Vermont, people all over this country are struggling to meet their fundamental needs. They are unable to exercise their basic human rights to housing, health care, food, education, and dignified work, as prevailing austerity policies cut the public services and programs essential to realizing those rights. The campaign in Vermont exemplifies how we can use human rights to develop an entirely different way of making budgets. The tools piloted in Vermont seek to guide accountable and participatory public policies that take government's human rights obligations seriously and make progress toward meeting fundamental needs and realizing rights. A People's Budget is grounded in five human rights principles: universality, equity, transparency, accountability and participation. Budget and revenue policies must be developed, implemented and measured based on these principles. The People’s Budget Framework offers an initial outline of a detailed accountability system for setting budget and revenue goals guided by human rights principles and measuring progress in meeting needs and realizing rights. Vermont's first People’s Budget bill (2012) is a blueprint for laying the legislative foundation for human rights budgeting. After passing initial commitments into law, the second People's Budget bill (2013) proposed to operationalize two elements of a People's Budget process: public participation at state level and rights-based needs assessments. The third People's Budget bill(2014) focused on defining the principles to advance accountability, and set out guidelines for a needs assessment process.